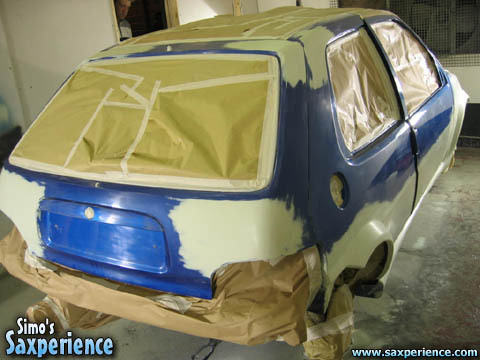 With next to no time left before the French Car Show, a huge amount of effort was needed to finish preparing the bodywork and fully re-spraying the car! To help out as much as I could, I took some time off work and worked at Sabre's bodyshop, for 3 days solid... working between 12 and 16 hour days! 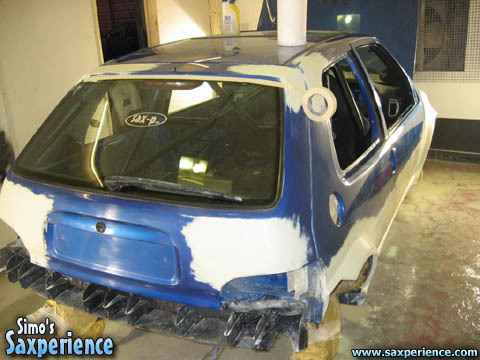 After preparing all of the body panels with fine filler, the primer was applied. Salvo stayed up until 3am two days before the show to complete this! Thanks very much! The morning after, I began to flat all of the bodywork down and prepare it for the top coat... this took a long time, as the whole car was flatted with two different grades of wet and dry paper! 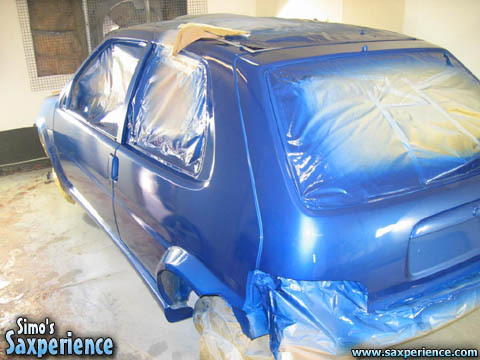 During the early hours of Friday morning, Salvo applied the blue paint and several coats of lacquer... by the time I got back to the body shop the paint had dried and I was able to rub down the whole car again with super fine wet and dry paper. Scary stuff! 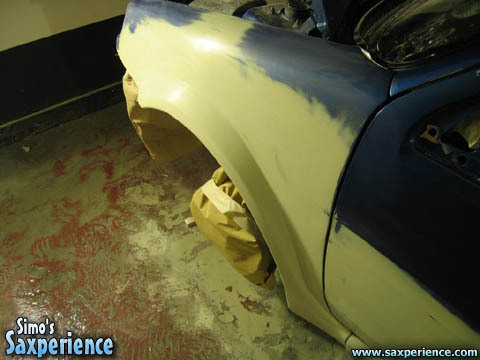 Once the car had been flatted all over, it was polished and buffed... this is when it REALLY started to shine and the vision we had waited so long to see, was emerging! The car was rebuilt on Saturday morning, replacing the wheels, windows, door locks, seals, etc, etc... there were loads of parts to re-fit! I left Sabre's bodyshop at Midnight on Saturday and set off to get to the Hotel, ready for the FCS on Sunday morning! Now that's cutting it close! After getting about 3 hours sleep, it was time to head off to the show, which actually turned out to be a fantastic day... everyone on the Saxperience stand did us proud!